When I met Lynn and a bunch of other knittyheads at WEBS she gave me some lovely sock yarn as a gift. I knit so many socks, she said, and she doesn’t – obviously I would use this yarn in no time. Well, that’s not exactly true. It was October 2006. 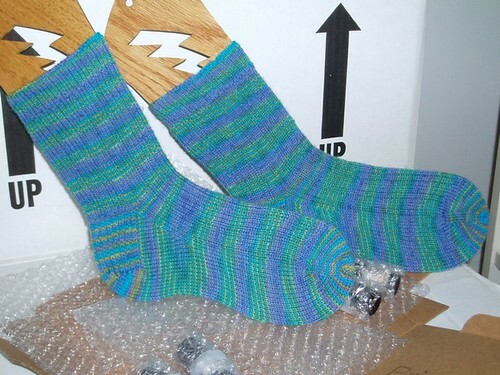 When I did finally get around to knitting the yarn the socks took me a month to finish! I’ll pretend that I artfully posed the socks on the pile of moving boxes, but that is actually where I’m going to let them sit to dry. This moving thing is crazy! The fact that the socks took me forever to get around to is actually because I kept having ideas (and ideas, and ideas) about what to do with this particular yarn. I wound it ages ago and then started being indecisive about my pattern choice. I think the Yarrow Rib, which I finally decided on, was a good choice. The yarn is fairly high contrast – yet strangely harmonious! – and any patterning would be lost in it. So thank you Lynn for the fabulous yarn which will finally get worn as its intended object – just as soon as it gets colder. they are beautiful.. I was just wondering how many socks you have made this year, seems like a bunch. Wow, they turned out really pretty. I really like that colorway!